This story originally appeared in The Aurora Beacon-News on October 29, 2013. AURORA — Lago Delsol Guzman stood outside East Aurora’s Dieterich Elementary. It was August, the first day of school, and she was waiting to pick up her 7-year-old sister. A Dieterich mother noticed that Guzman looked upset. She and Guzman’s mother, Denisse Barrios, encouraged Guzman to sing a song about what was bothering her and offered to record it. Dressed in a black T-shirt and black athletic shorts, Guzman looked straight into the camera and told her story. “I was extremely bullied and it led to the point where I was self-injuring,” Guzman said in a video that was posted to YouTube. Guzman belted out the lyrics to “Skyscraper,” a 2011 song by Demi Lovato, a 21-year-old Latina singer, who, like Guzman, suffered from bullying and was treated in a rehab facility for an eating disorder and self-injury. Guzman’s experience with bullies started in second grade, she said, when she was at Dieterich Elementary. She was a quiet student, she said, who had struggled since preschool with overeating. Guzman became the target of a female bully in her class who told Guzman she was fat. In third grade, Guzman was bullied by a former friend, she said, who urged classmates not to befriend her and also made fun of her weight. Barrios said she confronted the other student’s mother, pleading with her to put an end to her daughter’s behavior. After telling the school principal what had happened, Barrios requested to have her daughter moved to a new third grade class. Students being harassed or put in a hostile environment are encouraged to report it. Guzman said after the switch the bullying continued at recess and she sunk into a depression. In spring of her third grade year, she started cutting her wrist with the point of her pencil during a test, she said. 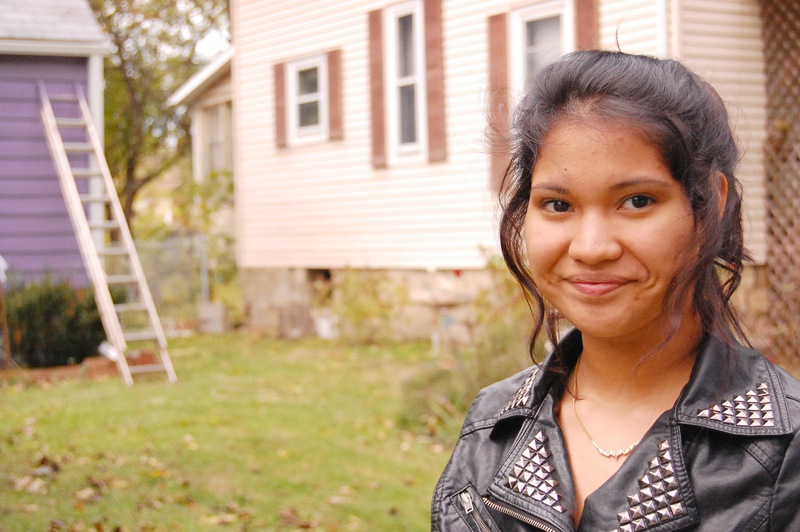 The bully moved out of the district later that year and life improved for Guzman. She stopped cutting and worrying as much about her weight. But the cutting and eating disorder cropped up again when she was in seventh grade at Waldo Middle School. She knew because the boys told her so. It’s difficult to collect data on how many children and teens self-injure since the wounds often go unnoticed or unreported. According to the National Hospital Ambulatory Medical Care Survey, there were 713,000 visits to U.S. hospital emergency departments from self-inflicted injuries in 2010, the latest data available. A 2010 article in the Journal of the American Board of Family Medicine, which reviewed research on teens and self-injury during the 2000s found that teens, in general, are at a higher risk for self-injury, and about 15 percent of teens have reported some form of self-injury. Typically the behavior starts between the ages of 14 and 24, the report found, with a peak during early and late teen years. Sean Youngstedt, a clinical therapist for Linden Oaks at Edward Hospital in Naperville, has worked with teens who self-injure for nine years. He started the hospital’s outpatient program that helps teens recover from self-injury. It’s the program Guzman eventually checked into earlier this year. According to Youngstedt, self-injury often is the result of an attempt to cope with an overwhelming feeling, or to feel anything at all. Teens who self-injure may be facing a life crisis, like a divorce or death in the family, or are living with parents who are stressed. Childhood abuse and trauma can lead to self-injury and so can bullying and academic pressures. Children with anxiety and eating disorders have a higher risk for self-injury, Youngstedt said. Self-injury causes a release of endorphins that can relieve some pain. But over time, the injury has to increase in severity and frequency to have the same effect, creating a cycle much like a drug addition. That cycle can cause a loss of control and feelings of shame. Youngstedt said those who self-injure often hide the behavior from their parents and friends because they fear a negative reaction or having to stop. “It’s not uncommon for schools to notice it before the parents do,” Youngstedt said, adding that Linden Oaks receives many patient referrals from schools. His program serves 12- to 20-year-olds. On average, he said, his patients are 14 or 15. A large majority are teenage girls. He sees spikes in patients when school is in session, Youngstedt said, likely because school can be a stressful environment. There are theories that self-injury often starts in middle school, he said, because that’s when students explore their identities and deal with heightened peer pressure. Society’s focus on instant gratification, he said, can negatively affect how teens cope with their emotions. Guzman started skipping meals in seventh grade and continued in eighth grade. She dropped about 30 pounds in five months, she said. At lunch time, she gave away her food to friends. She read depressing quotes on the Internet, she said, and often found herself looking at photos of skinny models and dancers. She cried in her sleep and didn’t want to come out of her room. Barrios said she noticed that her daughter was losing a lot of weight and became concerned. In September 2012, Guzman finally sat down with her mother and came clean about the cutting and how she’d lost so much weight. Barrios, who is a single mother of three, kept a close eye on her middle daughter. “I told her that she has to eat and she just was telling me I really don’t know how hard the school was and that I didn’t understand her because I hadn’t been in her school and things had changed and it’s nothing like the old schools,” Barrios said. When Guzman’s eating disorder intensified and she started having suicidal thoughts, Barrios sought professional help. She took her daughter to Linden Oak’s self-injury recovery program from mid-March to June. About one week was spent in in-patient treatment, Barrios said, which is reserved for severe and potentially life-threatening cases that need to be monitored 24/7. The rest of the time was spent in outpatient treatment, Barrios said. Youngstedt said that program consists of six to seven hours of daily behavior therapy in individual, family and group sessions. Teens learn how to assert themselves and express their needs, he said, as well as identify what they’re feeling and how to calm down and tolerate difficult emotions. The program also focuses on raising a teen’s mood, possibly by doing activities, and learning to live in the present, instead of fixating on the past or future. At the same time, parents are taught communication skills. It’s been several months since Guzman stopped treatment, but she said she still is trying to recover 100 percent. Now a freshman at East Aurora High School, she follows a meal plan that her counselors set for her. But after having to gain weight at Linden Oaks, she still winches when she weighs herself. She likes to read a paper she received as part of her program that helps calm her down. She is working with her school to avoid bullies. In the past she’s eaten in her teacher’s classroom instead of the lunchroom. She says she wishes she’d told her mother sooner, that she hadn’t lied to her therapist and counselor, saying everything was OK.
She hopes the singing video she posted on YouTube will be an inspiration to others battling bullying to speak up. “It’s just something that people can know they’re not the only people out there who’ve been teared down and hurt and feel like they’re nothing,” she said. Barrios, who cares for elderly residents who have memory issues at Asbury Gardens in North Aurora, a supportive living program, recently changed her hours so she can be home more often after-school and on weekends. She said it’s hard to raise her three daughters, work and stay on top of Guzman, always making sure she’s eating and checking her arm for marks.